If you’ve been around the R/C hobby for a while, chances are you’ve put together a Tamiya kit or two. While I personally haven’t had the opportunity to build or drive a vehicle from one of the “standards of radio-control”, I do admire the thought and craftsmanship that goes into each Tamiya product. For those of you looking for something a little different in the scale/off-road scene, Tamiya is releasing a new, ready-to-run (RTR) version of their Mercedes-Benz Unimog 425 Kit (#58609). Riding on their CC01 chassis/platform, the new RTR Mercedes-Benz Unimog (#57896) is a 1/10 scale, 4-wheel drive truck that is packaged for fun. 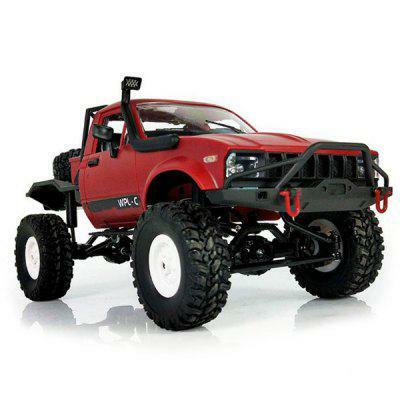 With included oil-filled shocks, 540-size brushed motor, a Finespec 2.4GHz radio system and a number of other features, this is a unique-looking vehicle that’s sure to grab attention wherever it goes. Special feature 1 The angular body lines of the Unimog 425 are accurately depicted in durable polycarbonate and pre-painted in orange. Special feature 2 The CC-01 chassis features a full-time 4WD system and front double wishbone, rear 4-link rigid suspension equipped with 4 CVA oil dampers. Special feature 3 Finespec 2.4GHz R/C system is pre-installed. Special feature 4 TEU-105BK ESC (equipped with BEC) comes pre-installed. While it is being marketed as a RTR model, you will need to supply a battery for the model (7.2v) and charger. Carrying a price of $547.00, this vehicle should be available for purchase from Tamiya’s website soon (as well as from hobby shops). Learn more about the new RTR Mercedes-Benz Unimog – CC01 425 at tamiyausa.com.